Welcome to Red Couch Recipes Day Four of Blueberry Week! Today is Literary Feast Day's: "Book and Cook Day"! The instructions are simple. Snuggle up with a little loved one, your child or grandchild and read the book "Blueberries for Sal," then make the blueberry soup! Even better, read the book, go blueberry picking, and then make the soup! This soup is easy enough for little hands to help! Don't forget to enter my GIVEAWAY where FIVE lucky winners will each receive 4 bottles of Girard's premium dressing. Click HERE for the giveaway! The first time I was served a fruit soup I fell in love! I was at Girl's Camp, of ALL places! Didn't they know that Camp food is supposed to be bad? The addition of this cranberry juice in this soup makes it SMASHING! "Blueberries for Sal," was written by Robert McCloskey in 1948 and won the prestigious "Caldecott Award." 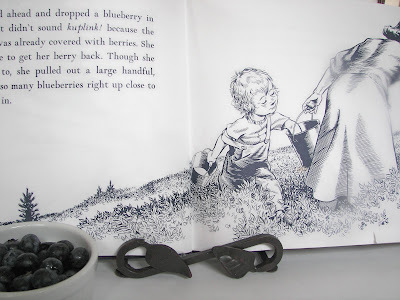 In the book, Sal and her mother go pick blueberries on "Blueberry Hill." "Little Sal picked three berries and dropped them in her little tin pail...kuplink, kuplank, kuplunk!" She picked three more berries and ate them. Then she picked more berries and dropped one in the pail-kuplunk. And the rest she ate. Then Little Sal ate all four blueberries out of her pail!." In this picture, Little Sal begins to eat blueberries out of her mother's pail. The adventure goes on and Little Sal and his mother meet up with a mother bear and her cub who are eating blueberries too and the mothers and "cubs" get a bit mixed up! It is a fun, short read! Bears really do like blueberries! Years ago when my son, who is now 16, was about one we used to go to Apple Hill in the foothills of the Sierra Nevadas to a wonderful place called Apple Hill. There at the Bolster's Hilltop Ranch we picked blueberries. My husband and I picked them and he ATE them! 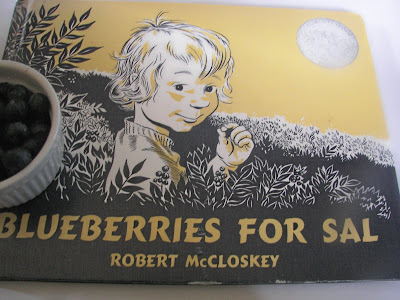 This book reminds me of picking blueberries with my own son. Though hard to tell, he has blueberries clenched in his hands. Like Sal, he ate and ate! I really hope you make this soup! All of us loved it sooo much. If you are leery of the cream, read Pattie's post, from the blog Bramasole yesterday...it's the portion size! Eat smaller portions! I served the soup in little ramekins. This is not a Red Couch Recipes Original Recipe; I have had this recipe for years, but do not know the source. 2 cups fresh or frozen blueberries -- Of course I used fresh! 3/4 cups lemon juice -- I wimped and used bottled. 1-1/4cup cranberry juice -- I used 100 percent, no sugar added. 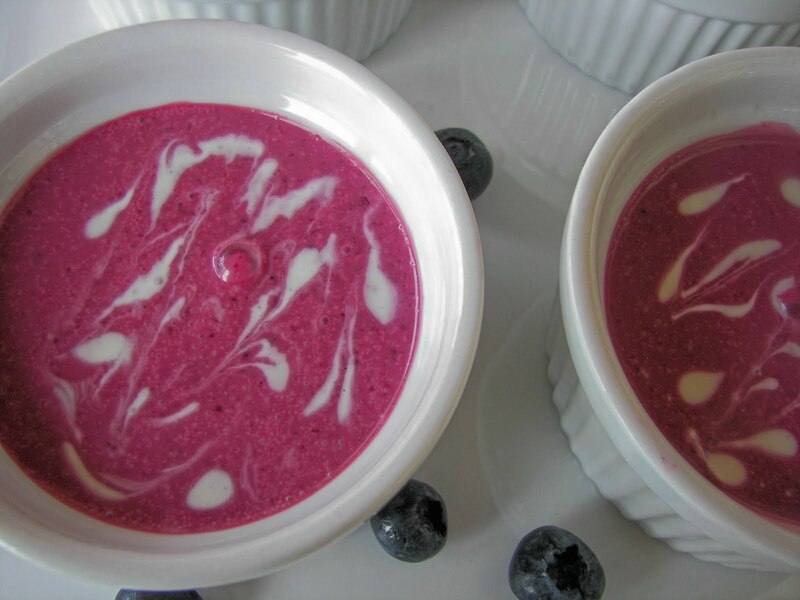 Put blueberries in a blender and puree until smooth. 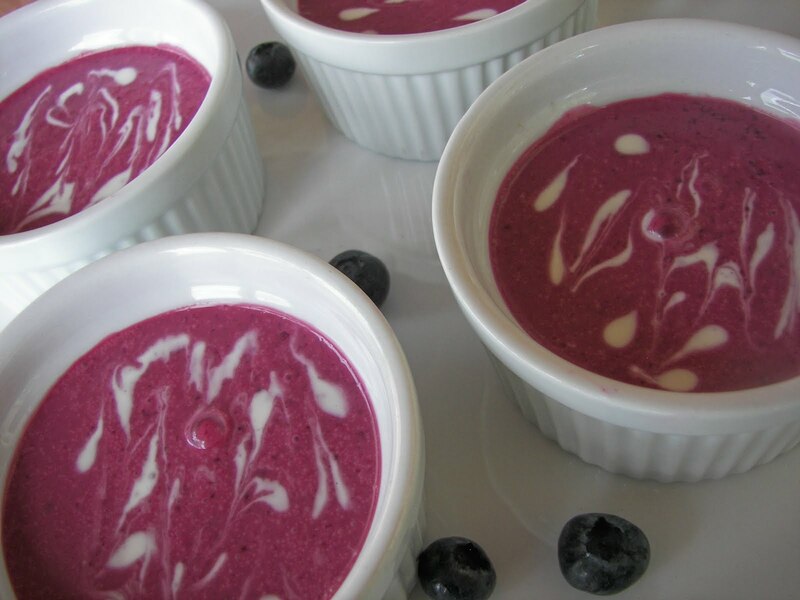 In a medium saucepan, combine the blueberries, lemon juice, cranberry juice, and sugar. Stir until mixed together. Simmer on low heat, covered, for 10 minutes. Turn heat off and let cool for about 20 minutes. Gently stir in the whipped cream. Put the pan in the refrigerator and chill for three hours. Pour the soup into bowls and decorate with additional whipping cream. Notes: I put my cream in a ziploc bag and cut a small hole at the end. I then put dots of cream on the soup and dragged it with a skewer to get the design. You could have fun with this and make more complicated designs. Thank you for dropping by Red Couch Recipes for Blueberry Week! Hope you found the couch comfortable and your stay enjoyable! I have posted this with Tickled Pink at 504 Main. That sounds delicious, and looks very pretty! I like your idea of decorating across the top with the whipped cream. I love blueberries too! Have a great wknd! I just LOVE this idea! I think I may have to do this with my son's pre-school class! I am in love with the idea of picking a book and doing a cooking/craft/somesort of project to go along with it. Thx for sharing!! I first had fruit soup in Hungary. . .loved it and have tried to make it several times but never with blueberries. . .will have to put it on the list. We love that book. . .we have a Grandma Sally so it was a must have for us! 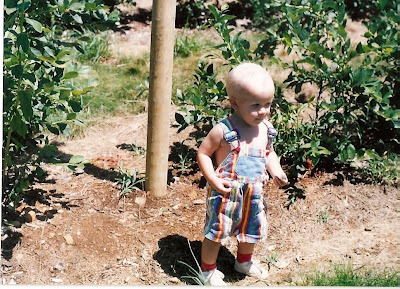 Such a beautiful post - and very touching to see your own little "Sal" toddling around. 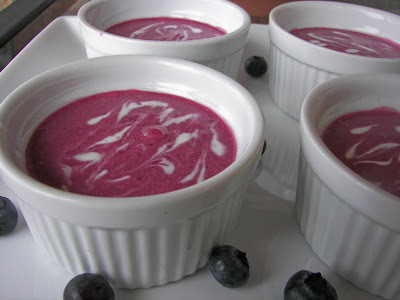 Blueberry soup is on my 'must-eat' list! This sounds delicious. I love blueberries and haven't had a fruit soup in years. I'm definately going to give it a try. Like a warm smoothie. I should try this since I have all these ingredients and it would be nice to try something different. This would be a lovely addition to my Vegetarian Foodie Friday Carnival if you are interested too. This is just gorgeous. Try the recipe again! I edited my recipe, saying only use 1/4 C. as it might get too sweet, and again on the drizzle on the topping,that it might get too sweet. Hope that helps. For Tally - Thank you so much for your sweeeeeeeeeeet comment. I want to be cute as you when I grow up, oh I guess it doesn't work that way, but Grandmas can be cute too can't they? Thanks for being my youngest follower. What could be more perfect than a lovely fruit soup on a warm summer day? And what a sweet little book. I'll look for it in the library and I'm sure my little granddaughter will love it. Nice post. My kids always loved Caldicott books. The soup looks wonderful. I've had strawberry soup, but not blueberry. My husband refuses to even try these cold fruit soups. Maybe if I call it dessert he will change his mind. Oh that looks good! I have never had anything like it either. I love cream, and have no problem with it, lol!! This was a favorite of my boys (and mine) when they were little. We love cold soups and continue to try to introduce them here in the midwest. The blueberry season is still with us for another week or so and this will be on our cool food menu! I love that book!! Thanks for reminding me of a great read. Almost blueberry season here and I can't wait. I am going to have to make some of your great recipes including this one. YUM!! Joni, I'm going to try making your slushies and I have a question: Do you use one of the large cans of frozen juice or one of the small ones? We had a romantic dinner for two out in the backyard today with your fabulous pork in fennel sauce. I can still taste it in my mouth. I took photos. I will e-mail you one. What a very fun idea. The book is adorable and I think the soup looks yummy. This is a great way to start liking "soup"...thinking of my little ones. Thanks Joni. I've been gone and am catching up on your blog...always a treat! I am making this and I want that book. This tickles me pink! Thanks for linking to Tickled Pink a couple weeks ago...I took a little (unexpected break) but I am back!